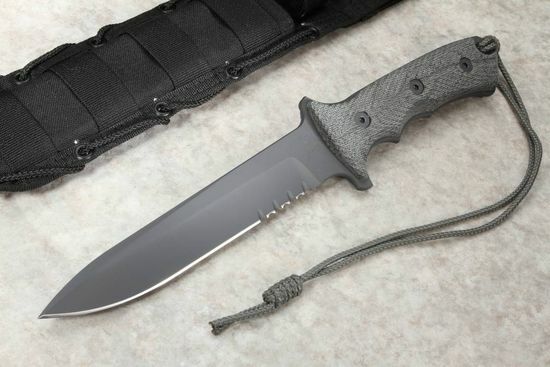 Known to the Green Berets as "The Yarborough" and to everyone else as "The Green Beret Knife", this no-nonsense, hardworking tool was designed by renowned knifemaker and designer Bill Harsey with function and manufacturing input from Chris Reeve. The Green Beret Knife for sale at KnifeArt is the 7-inch model, which is a great size for a variety of field uses. 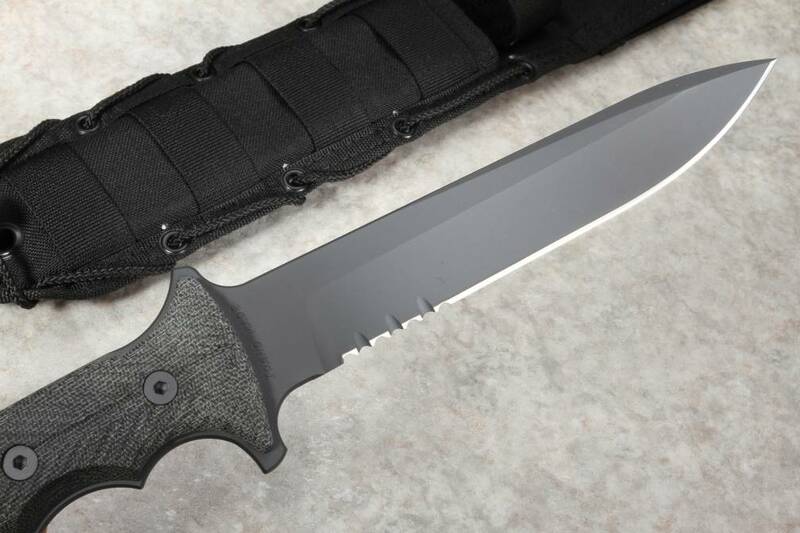 This knife is made in Boise, Idaho and is used by many members of the U.S. Army Special Forces and other elite military operators. Tough soldiers need a tough utility knife, and the Chris Reeve Green Beret Knife delivers on all counts. With its wear-resistant design for the many elements, the outdoors can throw at people, you will want it in your hand. 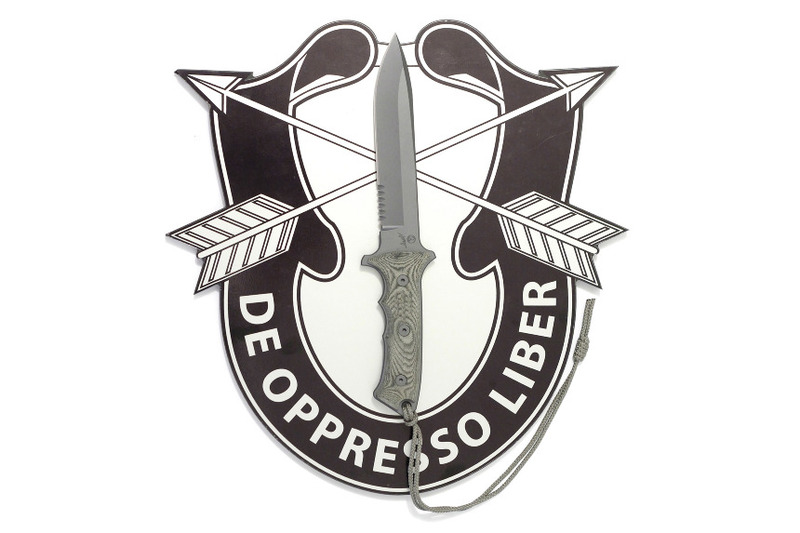 The Green Beret Knife comes in both a 7-inch and a 5.5-inch blade length; the knife you see here is the larger blade size. The spear point shape provides a reinforced tip and a nice curving cutting surface. The base of the blade has a row of serrations for cutting rope or webbing. The American-made S35VN steel is a great all-purpose, balanced high-performance stainless steel. It is engineered with a blade thickness of 0.22 inches and a hollow grind for maximum sharpness. At 55-57 RC, the Rockwell rating is in the perfect range for survival knives, as this is better for standing up to brutal wilderness use whether chopping, prying or digging while also holding a good edge for longer. The blade has a matte KG Gun-Kote that provides additional protection from abrasion or the elements. Your Yarborough knife is the perfect blend of hardness and durability. The handle of the GB Knife is a blasted canvas micarta that camouflages in many environments. Canvas micarta was specifically selected for this knife as an extremely durable material that has excellent grip in a variety of weather conditions. The full tang construction provides the user with an extremely strong balanced blade. The tang of the knife is rounded to make the knife comfortable while in use. 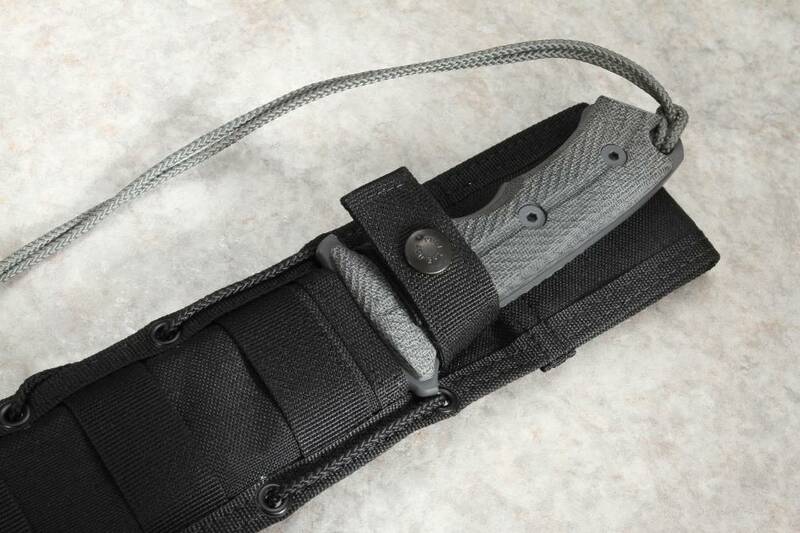 The Green Beret knife handle is completed with two raised double guards and a lanyard to help secure the knife in hand. This Chris Reeve fixed blade knife is completed with an American-made nylon sheath with a Kydex insert that helps guard the blade. 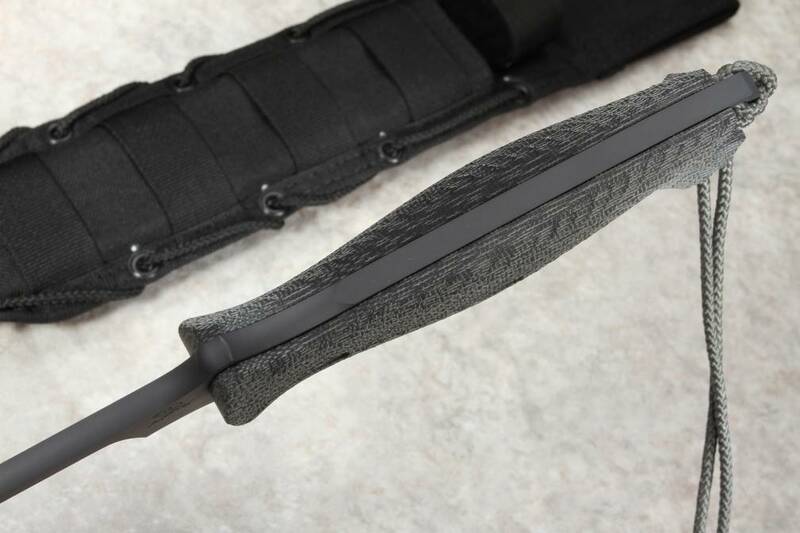 The GB sheath is a perfect complement to your molle rigging gear. 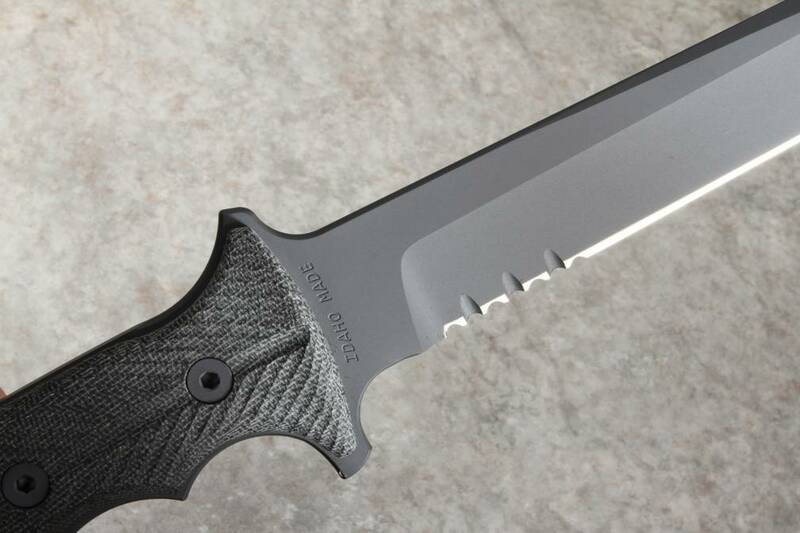 The Chris Reeve Knives Green Beret Knife for sale at KnifeArt is a specially designed tool that, just like the men who use it, is efficient, tough and uncompromising. CRK has been making knives and cutlery for more than 30 years, and this American-made fixed blade knife is part of their unending quest to "push the envelope" for function and reliability in the field. Order with confidence knowing your knife comes with a lifetime warranty from the manufacturer and a satisfaction guarantee from us. Try it out for seven days, and if it doesn't live up to what you expected or is defective, we'll exchange it for a replacement or refund your money. Shipping is fast and free everywhere in the U.S. if your order exceeds $150. Read our customer reviews to see why others love the Chris Reeve Yarborough knife. I own a handful of combat knives, including the original USMC KaBar. This is, hands down, my favorite combat knife. It is light for its size, excellent handle for control and comfortable grip, highly functional blade design, thick s35vn stock. Between this and my Busse Team Gemini, this is up at the top of my fixed blade collection. Holds an edge, easy to strop & resharpen edge. Great design, tough knife. Stout 5.5 blade is stronger I believe than the 7". Does what I need, no complaints. You can feel the solid quality in your hand. The Green Beret knife 7 inch is amazing..I recomend this knife Sharp-steel S35VN-great quality.. I would like to say thanks to Rodney and Knife Art is the best place to buy knives in USA. Wow, what a beautiful knife. Just got it today and am very pleased. Sharp out of the box, but added a dozen strokes with a Spyderco Sharp Maker with the ultra fine ceramic stones and its sharp as a razor. shaves hair like nothing. Taking it to my house in Alaska in a couple weeks for the real test. I have a fairly good collection of fixed blade knives made by individual blade smiths. I had very high expectations for the Chris Reeve Green Beret and I must say that this knife exceeds all of them. When you first handle this knife the thing that jumps out is of the overall handling and feel. There is obvious attention to detail since all metal has been rounded/shaped to perfectly work with the hand. The construction is extremely stout but there is a real balance to such a large and beefy blade. The grip fits my hands perfectly and the micarta has a very good feel with way it was finished. Using the blade I get the feel that you can pretty much do anything with this blade - exactly what I wanted since this knife is used for wilderness trips. Certainly not an EDC but when I want an all-around outdoors blade this is close to perfect. Finish is absolutely perfect. The blade was sharp out of the box but I did use Japanese water stones to increase this - I think they went a little safe with the factory grind angles. Edge retention is really great even with a slightly more aggressive angle. The coating is pretty good with only a few wear marks evident after some rather tough cutting and chopping experiments. The military-style sheath has a lot of features but I purchased the optional leather sheath from Gfeller which is what I used for a camping trip. The leather sheath is very high quality and fits the knife perfectly. I don't think you would regret buying this knife. Again, Chris Reeve knives are something that can be passed along to your grand kids. The blade is gorgeous - the finish is beautiful, yet subtle. The knife is balanced and feels comfortable in my large hands. The scales that adorn the handle are textured to ensure a good grip. Worth the price tag and then some - to top it off, KA fixed an error with the sheath that came with mine free of charge. Can't wait to take this thing backpacking when spring hits. It's going to replace my hatchet and folding knife to knock down some pack weight (since I'm confident I can do just about any task those two require with it). The sheath is a nice addition considering I can attach it to the loops on my pack for easy-access storage. All in all a great knife and sheath combination, and with KA's great support I'd certainly recommend this blade to anyone in the market for a sturdy, fixed-blade, dead-serious knife. The S35VN "super steel", one of the new formulations of powdered, sintered, steel from CPM, has excellent Cross-Grain modulus and durabilty rivaling that of high carbon steels without the orange stuff, making this knife an excellent survival tool for chopping or hard use. The blade retains its razor edge very well though I recommend sharpening before the blade dulls completely. A few strokes with a Spyderco Sharpmaker (as CR recommends) works fine. 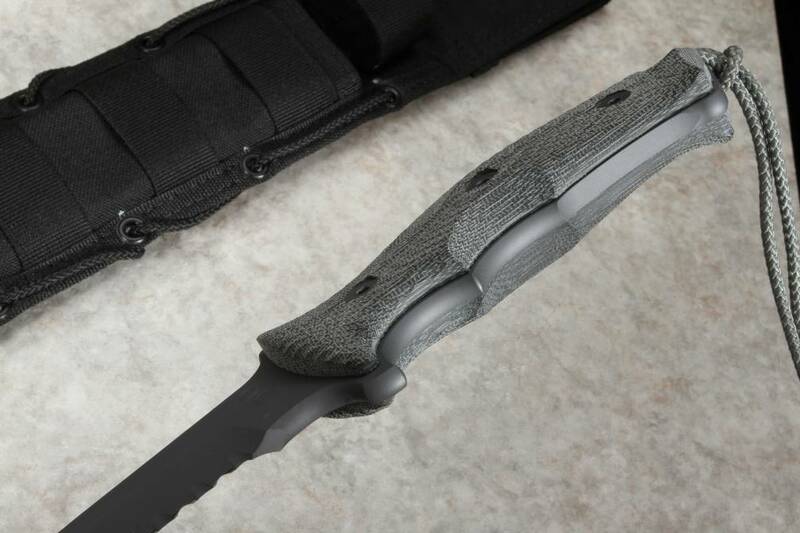 The Combat Master Sheath is an excellent one and is Molle compatible. Too bad it is no longer available in the original Foliage Grey-Green color that matches the Micarta handle and the KG Gun-Kote coating so well. The Green Beret "Yarborough" knife is, in my view, too heavy, broad and long to be a pure fighter. The "Pacific" or an Applegate-Fairburn (fixed, not the folder) would be a better choice for this application. My only complaint is that the micarta handle could be a bit broader and deeper providing for a more full hand. Larry and Rodney are excellent people to deal with. Superior steel alloy is what swayed me about this knife. The blade takes a VERY sharp edge and retains it. Do not know how difficult it is to re-sharpen as it does not dull easily. Blade is as heavy (dense) as carbon steel without the reddish-brown stuff. This is an excellent survival/combat knife and a not-too-bad two handed fighter. The blade is too long and too wide to be a pure fighting knife. An original Applegate-Fairburn or the CR Pacific or would be a better choice as a fighter. Received great customer service from the Larry and Rodney at KnifeArt.com.